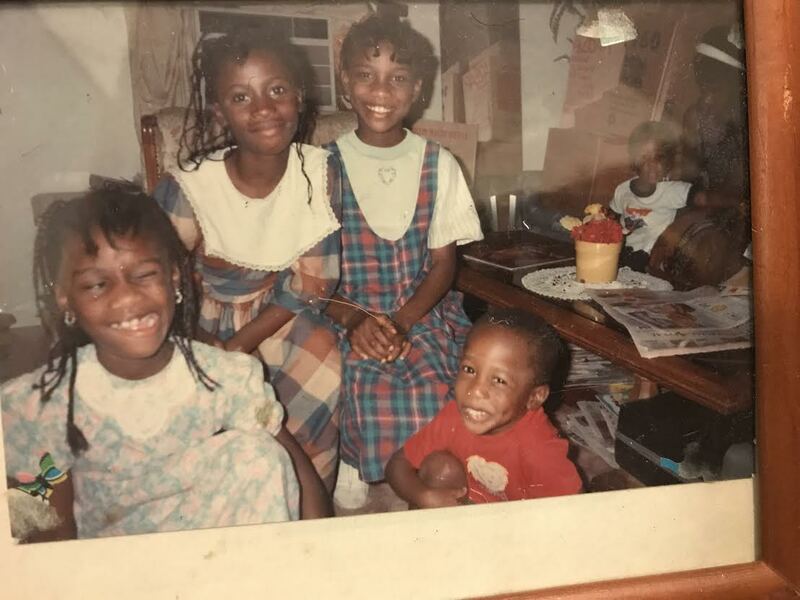 Moore, 7, and her siblings. In this series, we’re highlighting the stories of people who remain connected to their home countries—either those with immigrant parents or those who are immigrants themselves. With “We Are All Immigrants: Stories About the Places We’re From,” you’ll hear from those most acutely affected by changing policies and a shifting reality, those who exist as part of multiple cultures at once. Here, author Wayétu Moore reflects on her life in Texas as an immigrant from Liberia. I grew up in a small town called Spring, Texas, two dozen miles north of Houston. When I was sixteen years old, like other restless suburbanites, I was over-committed to extracurricular activities, spent an unreasonable amount of time with my friends, and my only real concern was how far I could stretch the $1/gallon gas on my middle-grade car. But one day, on my way to work a part-time sales job at the local Sears, while coasting down a freshly-paved road with new sub-divisions of identical homes on either side, it came on. It was a smooth sample of Tom Brock’s “There’s Nothing In This World That Can Stop Me From Loving You” over a honeyed beat. It was Jay-Z’s “Girls, Girls, Girls” and within the first 30 seconds, I knew I’d hear it at every party for the rest of the school year. “Fufu” was a dish I loved—round pounded starch that drowned in my mother’s famous seafood pepper soup. Why would they mock African food? African women? In that moment, the lyrics made me numb. Fufu was a dish I loved—why would they mock African food? I would later learn that the lyrics were referencing Eddie Murphy’s 1980’s comedy sketch, “Raw,” in which he marries an African woman called ‘umfufu’ that he can control. The sketch latched onto the stereotype of the submissive African woman, her aggressive and abusive African male partner, and “uncivilized” indigenous African people. The African woman in Jay-Z’s song was presented as poor, crude, and therefore deserving of mistreatment. I was born in Liberia, West Africa. My family immigrated to the United States in the winter of 1990 when I was 5 years old. I remember the shock of its whiteness–everything from the frosted streets to the faces of strangers seemed to me the same color as Monrovia’s rainy season clouds. I spent my developmental years in America, had only American friends and could not visit Liberia during my childhood because of ongoing political conflict. I didn’t register much difference between myself and my peers. Sure, I was conscious of my culture—my parents listened to African music regularly, we spent every summer visiting Liberian relatives in Minnesota or Memphis and our dining room table was never short of the deliciously sweet greens of Liberian cuisine, boiled cassava leaves mixed with palm oil and fresh peppers and beef—but my disparity was tempered by a seamless assimilation into American adolescent and teenage culture via my deluge of activity: track and tennis, theater arts and student council. My disparity was tempered by a seamless assimilation into American adolescent and teenage culture. Still, instances like that afternoon in high school served as interminable reminders of my difference, awakening the fact that being from a foreign culture in America meant that at any moment I could be pulled out of the dream and marked as ‘Other.’ During periods when the American dialogue focuses on foreign cultures that may seem to endanger a construct of American normalcy, these reminders are psychological warfare—a battle between my lived experience and the torrent of dehumanizing words, images and press that affirm misguided and incomplete archetypes of my culture. Murphy made ‘Raw’ in his early 20’s, before he ever visited any of the 54 countries in the vast continent of Africa. The image he paints can only stem from century-old stereotypes of the “African” (usually with no delineation of country) as a wild savage that permeate everyday culture still today. I got asked questions about Africa throughout my education from peers of all colors that reflected the lack of authentic representations of the continent that American students had. “Are there cars there?” “Why are there so many wars?” “Why do the leaders all steal?” “Why didn’t Africans tell colonialists to just leave?” “Are there really animals everywhere?” and many, many others. It was my father who ensured that I maintained my pride in Liberia, and ultimately in myself, during my developmental years when the perception of Africa outside of my home was so different from what I knew to be true. At summer camp one year, I lied and told everyone my name was Bernice. At summer camp one year, I lied and told everyone my name was Bernice, afraid of being made fun of for my African-sounding name. When my father found out, he first chastised my actions. Then he sought to reminded me of why I should be proud of my heritage. He shared the writings of Chinua Achebe and Bai T. Moore, old photographs and newspaper clippings, and reminded me of how indigene Liberians nurtured and expanded their early societies through commerce; local systems of religion and popular resistance methods to colonizers and settlers. Through those photographs and stories, he made me feel proud of traditional Liberian standards of beauty, deep dark skin, high cheeks and full lips, the opposite of what I regularly saw in my favorite magazines. My mother also contributed to my peace of mind, and that of my siblings, with stories of “back home” that glorified everything from the 70’s fashion of afros and kente cloth shirts to the music of Prince Nico Mbarga and Sonny Okosun. I loved to hear about what life was like for teenage girls attending Monrovian boarding schools. I read Chimamanda Ngozi Adiche’s Americanah in the fall of 2013, and it was my first experience with literary fiction told from the perspective of someone with a similar background. Although the character Ifemelu arrived in America much later than I did (she had already finished high school when she arrived), it was refreshing to see another version of my story on the page. I have experienced this more and more over the years, with the popularization of American African writers and African-centered films, all producing work to shift the narrative tropes about Africa that colored my childhood interactions. Through my business and my own writing, I try to contribute to a vast canon of African arts that deconstructs popular notions of African histories and identities. I am excited for what is to come in African literature and film—movies, books, songs that reshape what it means to be a contemporary African, and how it feels to be an African raised in America, a life forever in the margin. Moore’s debut novel She Would Be King is now available anywhere books are sold. You can find her on Instagram @wayetu.